People with disabilities face barriers to inclusion as full and autonomous members of society. Inclusion of a person with blindness on their commute, for example, requires tactile and audio signals on the bus, at crosswalks, on their cell phone, and to find the right building, the right floor, and the right room. It also requires special equipment and training on how to get around, as well as an employer, landlord, and bus driver who understands his or her needs and rights. Every element of this wide range of daily activities needs to be addressed for the person in the example and for all people with disabilities. Presently, we fall short. Poverty, unemployment, and underemployment are endemic among people with disabilities, despite their ubiquity across demographics. According to a Statistics Canada study, 15 percent of Saskatchewan’s population over fifteen years old in 2012 had one or more disabilities. Disabilities can be physical, sensory, cognitive, or intellectual, and they are associated with mental health, chronic disease, injury, aging, and/or genetics. An individual can have one or multiple disabilities in a unique combination, or can have similar limitations but a different diagnosis from another individual. Meanwhile, accommodations range from programs and services including education, vocational, income, recreational, and family respite; accessible infrastructure; co-ordination among service providers; access to assistive technology, equipment, supportive/accessible housing, and accessible transportation; advocacy; human resources, their training, and support; and medical treatments. Disability is both complex and complicated, and inclusion for all people with disabilities is extremely challenging. 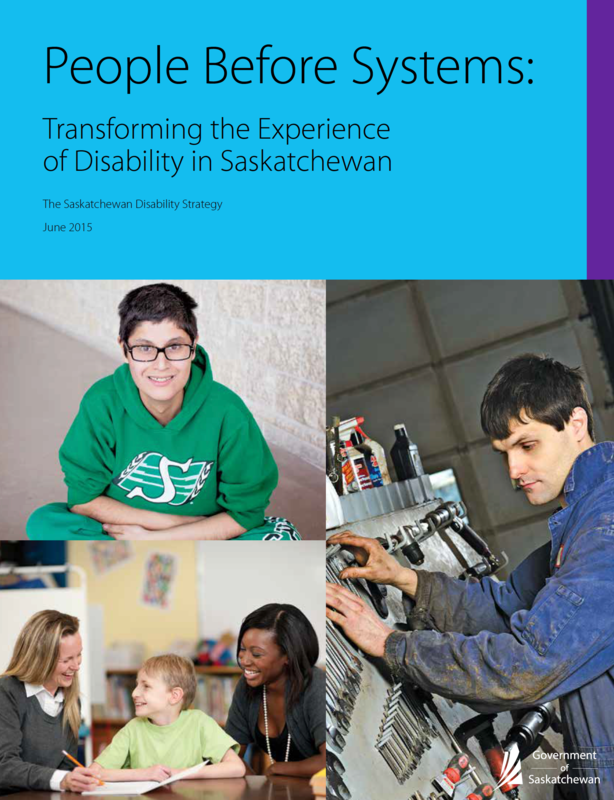 The Saskatchewan Disability Strategy (SDS) provides ambitious recommendations for how to improve the lives of people with disabilities in the province. 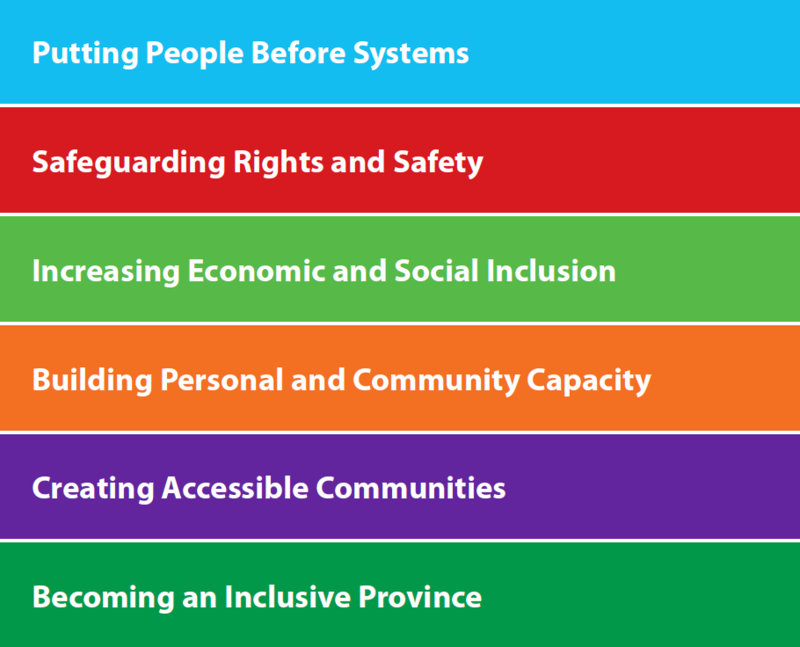 Indeed, the Saskatchewan Plan for Growth: Vision 2020 and Beyond report prioritizes “making Saskatchewan the best place in Canada for people with disabilities” (p.30). According to the SDS, a shared effort is required. The success of the strategy “depends on the further and collective efforts of many, including … community-based organizations, the private sector, governments …” (p.5). Although governments are key stakeholders in implementation, it is recognized that they are best equipped to standardize programs and services rather than to address the disparate and often complex needs of specific disability groups. To undertake that task, governments rely on partnerships with community-based organizations and the private sector. The SDS presents a vision of a strong co-ordinated network that spans sectors and organizational models. Co-operatives should occupy an important place in this implementation network, yet they are never mentioned in the SDS. The full title of the strategy — People Before Systems: Transforming the Experience of Disability in Saskatchewan: The Saskatchewan Disability Strategy — echoes a notion of self-determination that would be familiar to those steeped in co-op philosophy and operation. Self-determination is bluntly expressed in SDS’s vision: “Saskatchewan will be an inclusive province that is welcoming, responsive, innovative and accessible so that people who experience disability can live the life they choose” (emphasis added, p.47). One of the unique features of the co-operative organizational model is that it enables its users to make major decisions. Member ownership and the democratic principle of one-member, one-vote mean that decision making in co-ops belongs to the people they serve. Private and not-for-profit organizations in the disability sector often have person-centred missions and pursue them admirably, but their governance structures do not allow decision making to rest with the groups they serve. The co-operative model seems ideal for implementing a strategy oriented towards self-determination. Saskatchewan is already home to co-ops that address disability issues, including Crocus Co-op, Rainbow Housing Co-operative, and the community health clinics in Saskatoon and Regina. Crocus Co-op helps members self-manage their mental health disabilities by providing a respectful environment and programs in areas such as occupational skills, nutrition, and social-recreational activities. Rainbow Housing Co-op includes a provision for in-home care providers in its membership policy, which accommodates members with disabilities. And the community clinics are multistakeholder co-ops that offer mental health services in addition to specialized services for chronic disease and FASD in Saskatoon and Regina respectively. There would be challenges to expanding the role of co-ops in the implementation of the SDS. Saskatchewan’s disability sector is in chronic competition for scarce resources, so the environment may not be receptive to a shift of support or to the development of new co-ops. Nor should we assume that current disability co-ops have the capacity or interest to take on a more significant role. Furthermore, co-ops themselves face internal challenges. An individual co-op member has only limited influence, so he or she will not experience self-determination if most members prefer something that person does not. Member engagement is also an issue. Educating oneself on particular matters and making the effort to have one’s voice heard may be too burdensome or lacking in interest for members of any co-op. Co-operating itself can also be difficult. When something is easily available through the effort of others, it can be tempting to take advantage without contributing any effort yourself. All of these concerns would have to be identified and addressed if the co-op model is to become a successful aspect of SDS implementation. However, these challenges are not insurmountable. Co-operatives and social economy organizations around the world have been successfully addressing these issues for nearly two hundred years. Moreover, there is a desire in the disability sector for meaningful change and collaboration; framed in this light, the sector might be willing to accept a more prominent role for co-ops. As noted, co-operatives are likely to provide more self-determination than other organizational models. All organizations must make choices about what services to offer; those selected by a co-operative are likely to be different precisely because members have an opportunity to directly participate in decision making. Disability support is an important and complex issue. The SDS addresses it with a list of ambitious recommendations, one of which advocates collective implementation by a range of stakeholder groups including government, community-based organizations, and the private sector, among others. Co-operatives, as mentioned, are not explicitly considered. Since the implementation of the SDS has been delayed, there is still time to incorporate co-ops into the strategy. The co-op model would enable people with disabilities to experience self-determination — a key SDS theme — through member ownership and control. Although few in number, disability co-ops are already well established in Saskatchewan, and challenges to increasing their prominence are not, apparently, overwhelming. Canada has a history of marginalizing people with disabilities, but for the first time, real efforts are being made to truly include them in all levels of society. It is a major paradigm shift with substantial implementation challenges because of the diversity of disabilities, their associated needs, and the scope of intervention required. If we are to maintain the momentum of these efforts, we must recognize that the co-operative model has significant potential to help people with disabilities achieve the self-determination so critical to their participation as full, autonomous members of society. 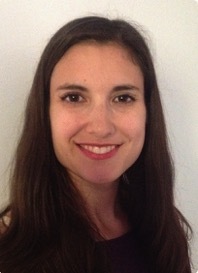 Victoria Taras is a PhD candidate in the Johnson Shoyama Graduate School of Public Policy at the University of Saskatchewan. Her dissertation is on the social economy of disability policy implementation. This entry was posted in Governance and tagged co-operatives, Crocus Co-op, decision making, disability, free-rider problem, governance, member engagement, member ownership, Rainbow Housing Co-operative, Regina Community Clinic, Saskatchewan Disability Strategy, Saskatchewan Plan for Growth, Saskatoon Community Clinic, self-determination by Nora Russell. Bookmark the permalink.